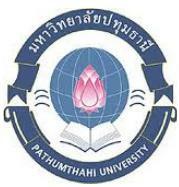 Pathumthani University is the private higher education institutions. Allowed to establish private higher education institutions under the “County College” on December 27, 2002 The purpose of establishing the Institute. To expand opportunities for youth in Pathum Thani province and nearby areas. Have the opportunity to study in higher education. In order to develop human resources of the country. The fully equipped with academic excellence. Highly skilled occupations, and endowed with a moral lifestyle. Which will develop the country. Since its inception, the College, Pathumthani. County College to perform the primary mission of universities to produce graduates, research, academic services to society. And preserving culture. Fully intact. Graduates who graduated from this institution. The matter has been a professional society and the nation with quality. And endowed with a moral. Bring the pride of the institution, faculty and administrators as well. And from the College, Pathumthani. Developed quickly and the quality is acceptable to the community and the nation’s colleges are also allowed to raise the status of a University of Bangkok in June 2005 was a particularly proud of the students, faculty and university administrators County. And encouragement to help them develop the Institute. Creation and development. Forward unceasingly. The leading universities of the local community and the nation. And our commitment to leading universities, internationally.